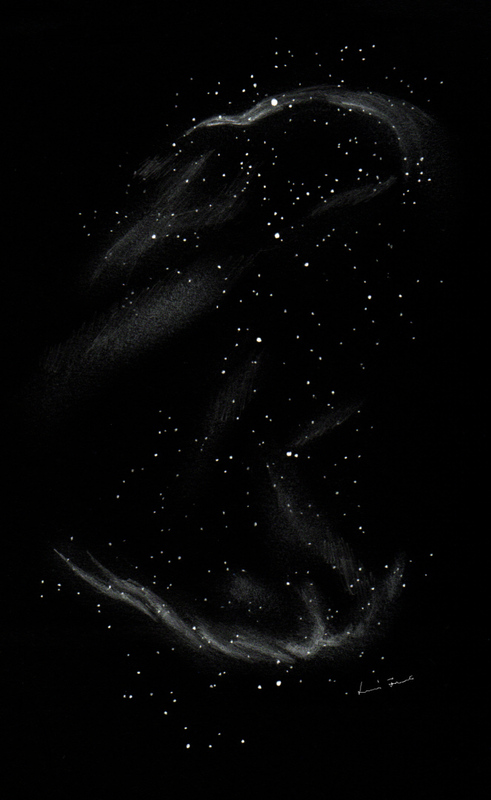 Dear ASOD, hereby sending my sketch of the Veil nebula. I wanted to sketch the whole Veil ever since I first saw this breathtaking nebula, but it’s so huge that I was never brave enough to give it a start. Some weeks ago I decided to give it a try, and here’s the result. It took about 2 hours to finish, with all stars and nebulous areas drawn at the eyepiece in one session. As I’m observing from a very steep valley, my horizon is very high, so it was a real race with the time – perhaps that’s why a lot of stars are missing from the “less important” regions. The sketch covers an area of about 4 times 1.5 FoV’s, done with a 12″ dobsonian, Baader Hyperion 21mm EP (71x), and a cheap O-III filter. Used an A/4 sketchbook, B and 5B pencils. Inverted on computer. Date/time: 08.27.2011 01:00-03:00 UT. Location: Nádasdladány, Hungary. SQM: 21.16m/arcsec^2. Fantastic, that’s a masterpiece! I bet each star is in the exact place, congratulations. By the way, it’s the first time I see a Full Veil sketch. An excellent and stunning rendition of the veil nebula in all its glory.